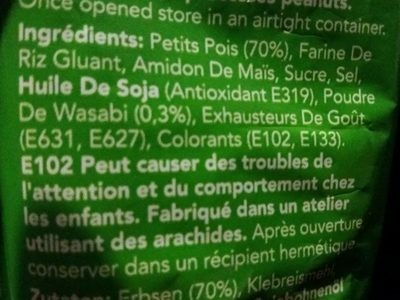 Green Peas (70%), Glutinous Rice Flour, Corn Starch, Sugar, Salt, Soybean Oil, Wasabi Powder (0.3%), Flavour Enhancers (631, 627), Colours (102, 133). 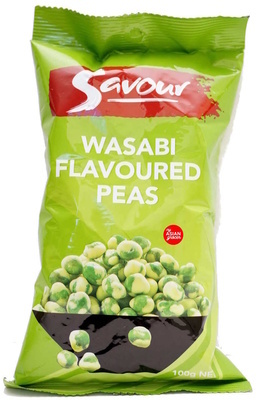 Product added on February 21, 2015 at 7:56:10 AM CET by foodorigins. 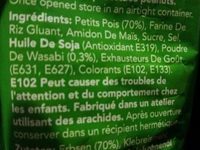 Last edit of product page on September 6, 2018 at 8:00:00 PM CEST by openfoodfacts-contributors. Product page also edited by kiliweb, ysculo.